In addition to writing about e-commerce tips and trends, I also run my own e-commerce side business, selling paper planners for freelancers. 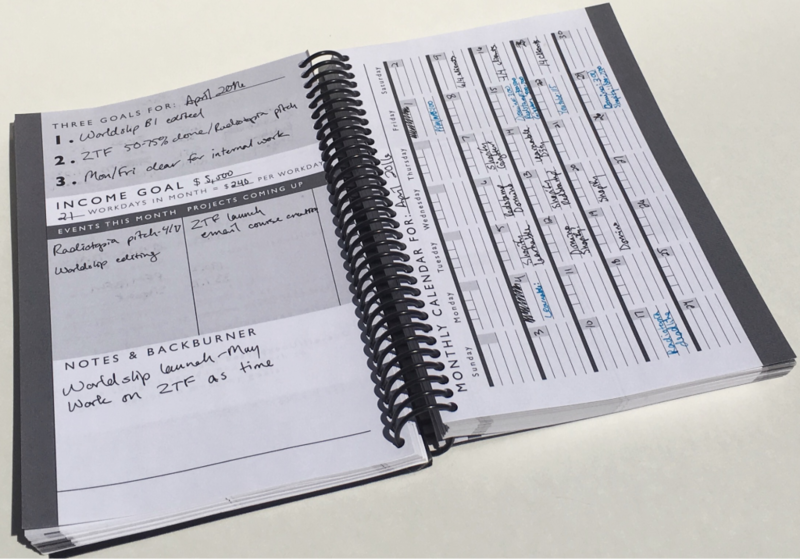 I initially funded the first run of planners via Kickstarter (head here for the full story of how I did that). Selling products online is fun, and I was super excited to start my e-commerce journey after the Kickstarter wrapped. But what I wasn’t fully prepared for was handling the administrative side of things. Shipping (and creating accurate shipping estimates) was one of my biggest struggles with the Kickstarter. That struggle continued to follow me as I set up my e-commerce store and continued to sell the planners. But, with the help of Ecwid, I overcame that hurdle & saved a ton of money in the process — read on to find out how. When it came time to pick an e-commerce platform, I was on a tight timeline to pick a shopping cart system and set it up quickly. I went with Shopify, because I’d heard it recommended a few times. I had a hard time setting it up and found the overall interface relatively unintuitive, but didn’t really think I had any better options, so I stuck it out. Earlier this year, I grew tired of paying $30+ a month (once processor fees were factored in) and still not having access to basic features like reports. After investigating my options, I decided that Ecwid was the best alternative — and, to my very pleasant surprise, my shop was set up in about ten minutes flat, with proper configuration for purchasing, shipping, and customer notification. One of the easiest things to set up with Ecwid is the Shipstation integration. With my previous e-commerce platform, I could never figure out how to get the integration to function at 100%. I was always having delays in syncing between my store and Shipstation, and for some reason, I couldn’t get Shipstation to recognize the weights I put into my store. This left me continually either undercharging customers, especially for international orders, where I was losing $10, or even $15-20, on shipping (my planners are heavy! ), or overcharging customers (even if only by a few dollars) and feeling bad about it. Setting flat shipping fees that were created by averaging out shipping costs isn’t the worst decision in the world, obviously — but it was a small annoyance that I couldn’t ever figure out how to fix, no matter how many tutorials I looked at. And during months when I had an influx of international orders, it definitely hurt my bottom line. Looking at my sales records since I switched to Ecwid, if we estimate that I was losing $10-20 per international order, Ecwid has saved me well over $100 in shipping fees in less than six months. And that’s while paying $14 less a month than I was on my Shopify basic plan, so the amount I’ve saved is even larger. In general, Ecwid’s ease of use has been a huge benefit in my business — and not just with shipping. Another feature I make regular use of is the ability to embed my shop (or a single product) on other sites. When you have as many side projects (and corresponding sites) as I do, being able to share the same product across multiple sites can help a lot with sales and save potential customers all the extra clicks it takes to go back to the original site and purchase there. Because of this, I can put my Freelancer Planners on my main blog’s shop page, as well as the corresponding Facebook page, without having to think of complicated workarounds or install third-party plugins, like I used to do. As a result, I can easier capitalize on the years of traffic and SEO I have for that blog, instead of (or rather, in addition to) sending people to a completely new site. This feature being available on all plans — even the lowest priced one — makes Ecwid stand out head & shoulders above the competition and is a strong reason I’d recommend it to any blogger looking to expand into e-commerce, whether you want to sell digital products or physical ones. And, as someone who is most familiar with WordPress and loves to use it for the hundreds of free and accessibly-priced premium themes and plugins, there’s another benefit to this embed-it-and-forget-it feature: I don’t have to switch to another CMS and then pay $150-200 per theme (which still needs heavy customization). All in all, the switch was a total no-brainer and I’ve never regretted my decision for an instant. If you’re ready to get rid of your shipping headaches once and for all, and get an easy-to-use, lightweight e-commerce system that you can set up in fifteen minutes and embed anywhere, definitely check out Ecwid. This story is written by an Ecwid merchant. If you sell with Ecwid and want to share your expertise with other merchants, you are welcome to become an author on the Ecwid blog.